Genesis: quoted over 200 times in the NT with never a hint that it was not taken literally! A person who truely believes Genesis will have no trouble believing the rest of the Bible. Genesis: origins of: universe, order, complexity, our solar system, atmosphere, hydrosphere, life, mankind, marriage, evil, language, government, culture, nations, religion, the chosen people, etc. Who wrote it? Moses was the compiler or he personally received the text from God Himself. Gen. 2:4 These are the generations of the heavens and the earth. Gen. 5:1 These are the generations of Adam. Gen. 6:9 These are the generations of Noah. Gen. 10:1 These are the generations of sons of Noah. Gen. 11:10 These are the generations of Shem. Gen. 11:27 These are the generations of Terah. 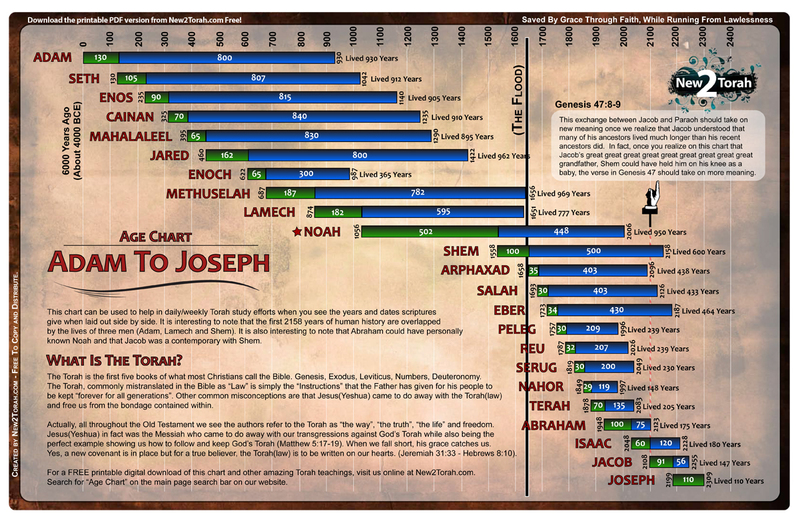 Gen. 25:12 These are the generations of Ishmael. Gen. 25:19 These are the generations of Isaac. Gen. 36:1 These are the generations of Esau who is Edom. Gen. 36:1 These are the generations of Esau, father of the Edomites. Gen. 37:2 These are the generations of Jacob. The creation of the universe took place 5 days before the creation of man? 1. (DAY 1) In the beginning(2) God(1) created(5) the heaven(3) and the earth(4). (1) Who is this God? Can we know Him? (Romans 1:20) For the invisible things of him from the creation of the world are clearly seen, being understood by the things that are made, even his eternal power and Godhead; so that they are without excuse! Elohim! Triune One God! I AM! The only true "pre-historic" cause. vs. 26 - "in OUR image (triune)"
vs. 27 - "in HIS image"
2a. And the earth [matter] was without form(6), and void(7); and darkness(9) was upon the face of the deep(8). He is in the process of creating the earth to be inhabited and placed under the dominion of mankind. At this point: no gravity, no electromagnetic forces. The physical universe had come into existence, but everything was still and dark. No form, no motion, no light. Awaiting activation. 2b. And the Spirit of God moved(10) upon the face of the waters. (10) A powerful statement. The word "spirit" is the same as "wind" or "breath". Now we see the Spirit of God (3rd person of the Godhead) energizing every part of the creation. The Spirit "moved/vibrated" in such a way as to begin the creation of light waves, heat waves, sound waves, gravity. The outflowing energy from the work of the Spirit began to flow outward into the entire cosmos. Creating innumerable star and planets. As God energized the beginning of the universe to bring form and life to His Creation, He later did the same to empower His prophets to bring into life His perfect Word. This is not the sun. God does not require the sun for there to be life. Knowing that light would be needed to bring life to His creative process. The matter began moving to form a great sphere. Elements, water, land, light. This sphere is to become the home to plants, animals and mankind. As we read Genesis, we discover God created everything in 6 days! Why not one second? He gives names to the light and the darkness. He gives a very plain definition to the first evening and morning. Evolution and Creation are total opposites and can not co-exist! 6. (DAY 2) And God said, Let there be a firmament in the midst of the waters, and let it divide the waters from the waters. He now separates the water into 2 distinct locations and for 2 distinct purposes, placing "space" between them. 7. And God made the firmament(11), and divided the waters which were under the firmament from the waters which were above the firmament: and it was so. (11) This process is completed. Now there is a great expanse of "space" separating the two bodies of water. Both bodies of water were opened and poured out on the earth during Noah's flood. 8. And God called the firmament Heaven(12). And the evening and the morning were the second day. (12) triune heaven. Firmament, space, atmosphere, the Heaven are synonymous. (from Genesis 2:5+6) "for the Lord had not caused it to rain upon the earth" "But there went up a mist from the earth"
The earth was like a perfect greenhouse. Perfect temperatures. No harsh winds or storms. No rain, just a daily mist. Vegetation everywhere and no barren deserts or ice caps. He again gives the definition of an evening and morning. 9. (DAY 3) And God said, Let the waters under the heaven be gathered together unto one place, and let the dry land appear: and it was so. The waters under the firmament are gathered together in such a way as to create dry areas of matter. He names the dry land and the bodies of water that are below the great firmament. God spoke a command to His creation. The grass, herbs and trees were created with seeds to allow them to multiple. And His command was obeyed. The definition of an evening and morning. The sun, moon and stars now take shape. He tells us the purpose of these lights. Specifically, He tells use the primary purpose of the sun and the moon. The sun, moon and stars are set into place. He tells us it is good for the periods of day and night to be separated into their rightful places. 20. (DAY 5) And God said, Let the waters bring forth abundantly the moving creature that hath life, and fowl that may fly above the earth in the open firmament of heaven. Everthing to bring forth after its "abundantly". Everthing to bring forth after its "abundantly" and after their "kind". 22. And God blessed them, saying, Be fruitful, and multiply, and fill(13) the waters in the seas, and let fowl multiply in the earth. There can be no doubt how long a "day" was. 11. For [because] in six days the LORD made heaven and earth, the sea, and all that in them is, and rested the seventh day: wherefore the LORD blessed the sabbath day, and hallowed it. 24. (DAY 6) And God said, Let the earth bring forth the living creature after his kind, cattle, and creeping thing, and beast of the earth after his kind: and it was so. God spoke into existence every kind of animal that would live on the dry land and told made them to reproduce only after their own "kind". He spoke it, and it was so. 26. And God said, Let us make man in our image, after our likeness(14): and let them have dominion(15) over the fish of the sea, and over the fowl of the air, and over the cattle, and over all the earth, and over every creeping thing that creepeth upon the earth. (14) Our likeness: Body, soul and spirit. (15) Mankind was created to have dominion over all the creatures of the land, sea and air. The procreation process requires male and female. 1. (DAY 7) Thus the heavens and the earth were finished, and all the host of them.